I’m continuing to #WorkOutLoud on the new book today: it explores how organisations plan for and enact change in the Social Age. 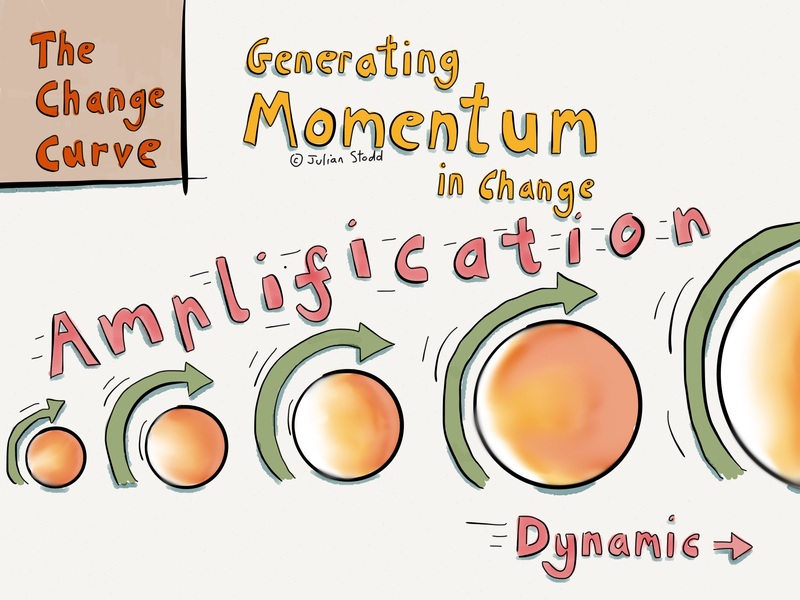 It’s based around three manifestations of change: ‘Resistant’ organisations, which deploy antibodies to kill change, ‘Constrained’ ones, who want to change but can’t get momentum, and ‘Dynamic’, who are agile and adaptive. 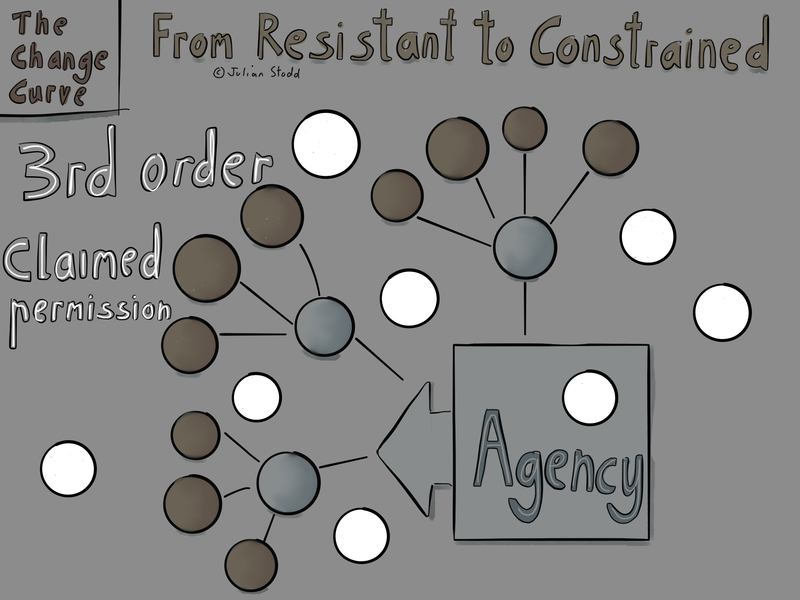 Today I’m expanding out the model that takes us from Resistant to Constrained. In this third part it explores the idea of Agency. Agency is the capacity of a person to act in a given environment: in a model of change that explores the journey from ‘intent‘ to ‘transformation‘, agency is an important notion. What permission do you have to engage, to think, to change? 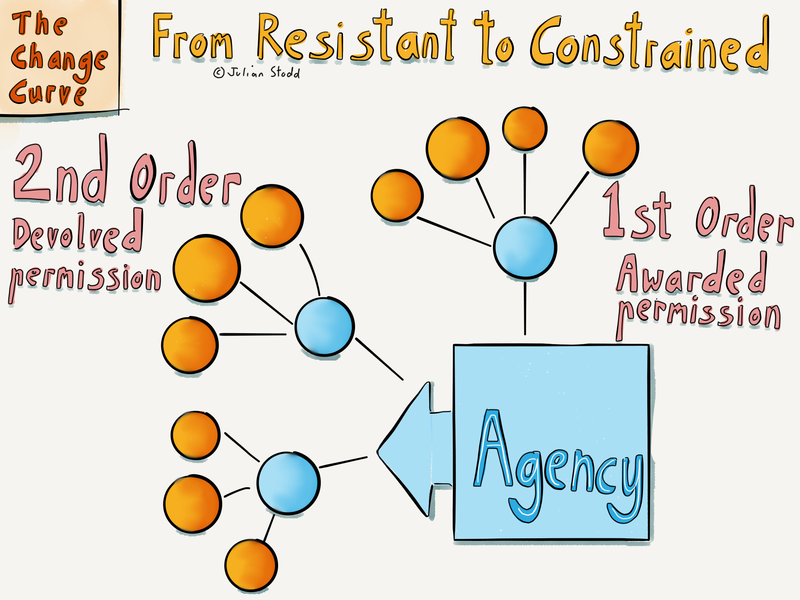 In Resistant Organisations, Agency is not granted, so it has be be cultivated, nurtured, devolved or claimed. Let’s consider this: to start the organisation on it’s journey away from Resistance, we don’t need to overcome all of the antibodies, nor do we have to create a large community of change agents. No, instead, we have to simply find space to start the conversations, lay the foundations and seed the communities. We have to lay foundations. This is an altogether lighter weight proposition, and one we can use in our planning stages to our advantage. When developing strategies to change the organisation, we can easily end up thinking we need critical mass, and that critical mass is a function of size. But it’s not. Mass is weight, not volume. We don’t need the largest percentage of the population: we need the people who can help us generate the most momentum. In the Social spaces, factors around amplification create disproportionate weight to a conversation: if we tell our stories effectively, engage with relevance to our amplifiers, the message will spread far. Except that in our case, it’s not just messages we are trying to propagate: it’s mindset and permissions. A mindset to question and be curious and a permission to engage in the conversation. Because Resistant organisations deny both this right and permission, we have to create our external spaces, our new and unowned spaces, to start the conversation, but the lever to effect true change is to generate momentum in the stories and spaces. To do that, we need to enable the enablers, facilitate those who will become the facilitators of change. We can view this as a first order effect: first, grant permission to a small group and work with them to segment and allocate the change. That which we don’t own, we allocate within this group, hoping that they will nurture the embryonic change communities. It all starts with individuals in a co-created and co-owned model of change. From there, we get second order effects; those people who gather momentum can devolve their authority into their nascent communities: they can empower through their leadership, they can gift their permission into the community. 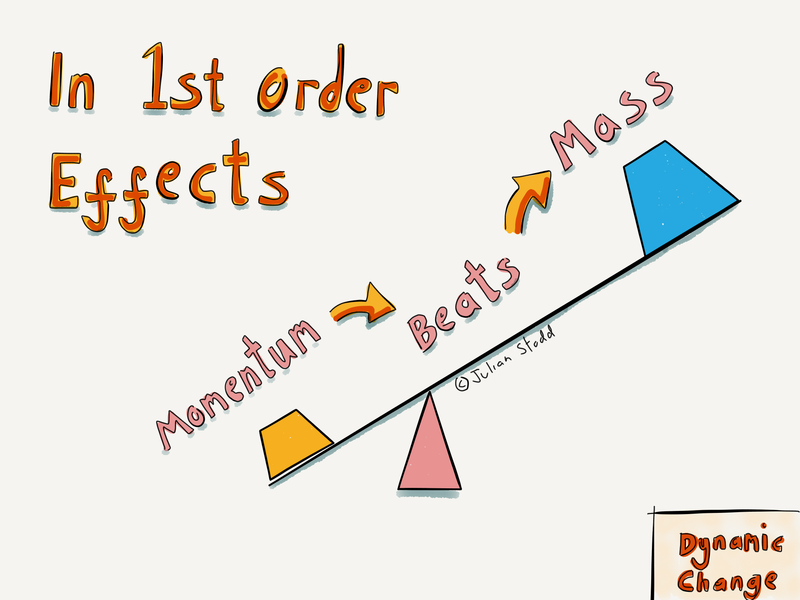 It’s at the level of the second order effects that we get greater size. But also greater diversity: in approach, in interests, in style, which is all good, because a diverse community is more adaptable and resistant to antibodies. A diverse community can call it out when it sees it: it’s strong and broad. There’s another important dimension to this approach: by devolving authority and ownership in a co-created and co-owned model, we create space for dissent. This may seem like a bad idea, but only if we are trying to own the story. As we move towards becoming Dynamic, we have to recognise that we can be in the conversation, but not own it: the win is that we can start to hear the dissent and use it to inform our story. If permission is not awarded or devolved, it will be claimed. Remember this: Social Authority can always and fully subvert the formal, whilst formal authority can never truly silence social. You can’t squash the subversive voices by trying to deny them a place to speak: you simply drive the conversation elsewhere. Conversely, you can’t stop people subverting the formal story, because social voices can always find new space to speak in. But instead of fearing this, as we relinquish some control, we find that we can be creative, we can benefit from these broad voices. Agency is the capacity to act in a certain environment: that capacity is not simply a function of rules, permissions or skill. It’s a dynamic interplay. We can’t influence every factor, but we don’t need to. We just need to work with a small group initially, award them a permission to be curious and to question, and allow them to devolve authority into their communities. We need to create the nodes and facilitate the amplifiers. That will give us a true foundation for change. Agency cannot be ‘done’ to people: it cannot be trained. It must perceived. It must be found. But once it is, we start to see the spark in our change efforts unleashed. This entry was posted in Change, Change Management and tagged Agency, Agile, Agility, Change, Change Curve, Change Management, Community, Dynamic Change, HR, Leadership, Organisational Change, Resistance, Sociology. Bookmark the permalink. ¿Tienes una traducción de tu utilización de la palabra Agency al español?